USDCHF is under the influence of the US economic reports such as: Philadelphia Fed Manufacturing Survey and Initial Jobless Claims report. The pair has been moving with bullish bias within the Andrews’ pitchfork and the ascendant channel. 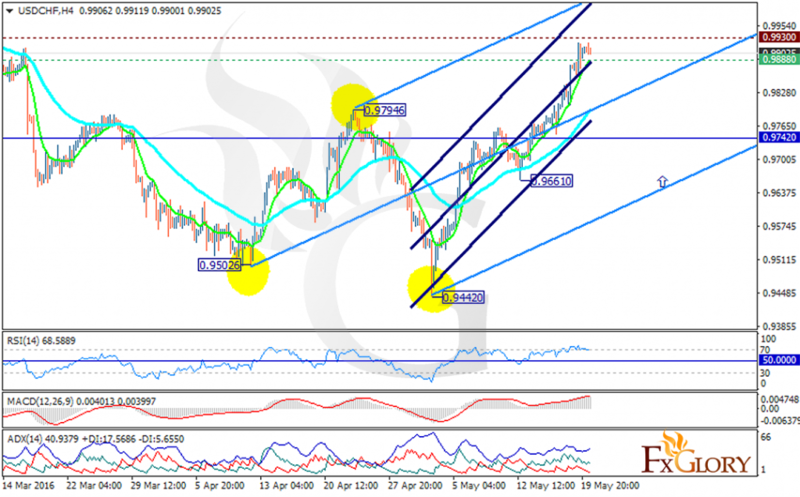 The support lies at 0.98880 with resistance at 0.99300 which both lines are above the weekly pivot point at 0.9742. The EMA of 10 is located above the EMA of 50 showing the price growth in the last recent days. All indicators are signaling a buy opportunity, the RSI is above the 50 level, the ADX is showing strong buyers and the MACD indicator is in positive territory. The resistance level breakout will smooth the way for further high targeting 0.9940.